Whether speaking of human physiology or esoteric martial arts, the ability to generate power and maintain proper movement and balance begins by identifying your center of gravity (itten) located in the lower abdomen - the hara. When haragei is optimally developed, a special quality of power emerges - one that exceeds ordinary muscular strength. The feeling of being rooted, yet agile, is essential in every system in the martial arts. In explaining one of the secrets of Okinawan karate, goju-ryu founder Chojun Miyagi used the parallel of a willow tree enduring a wind storm; while the top of the tree and its branches sway in the direction of the wind, the trunk remains unmovable and planted. Conversely, when one feels tense, or relies upon typical "arm strength", this point of energy (ki) rises, and causes the practitioner to become top-heavy and off-balance. This is why maintaining proper stances and rotating the hips during various techniques are so important in the martial arts. The ability to kiai and the audible breathing aspects of certain forms must also begin in the hara. The hara is also the reference point of mental focus in some meditation practices (mokuso), and is considered the seat of courage and intuition (kan), as expressed in having "guts" or a "gut feeling". Natives of many tribal cultures regard the abdominal region as the site of the mind, even the soul. Despite some of the mystical connotations associated with the hara, in practical terms it is the source of one's power, balance, and spirit in the martial arts. I think you make a very good point about the hara being deeply rooted in the mental focus as well. 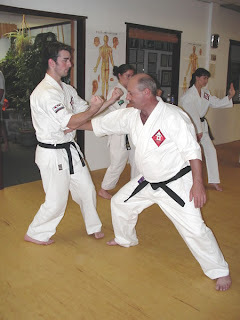 I had an opportunity to train for a day with Chief Master I.H. Lee, who's a 7th or 8th degree black belt in Songham TKD, and just about as high up (short of being Grand Master) as someone can get in the organization. Towards the end of the day, he made a really big point that no matter how well you can physically do everything required of your belt and beyond, what is the driving force ultimately is your chi or spirit in. But the terms he described it in sounds very much like how you describe hara here. Having both a mental AND physical grounding and balance is essential in representing and manuevering in martial arts. Since haragei is the art of deriving power (ki) and balance from the midsection, I imagine this could be a tricky undertaking in Korean styles known for their high and frequent kicks. All the more imperative for that reason. Still, the concept of ki/chi is identical in all Asian martial arts. Woah, can I train on that beach too? I wonder what caused us to focus so much on upper body strengh? Boxing? or simply looks? Funny that the part that gives you the most strengh is the link to your upper and lower body parts. logic, in fact. "My stomach was tied in a knot." "I had butterflies in my stomach." "I felt sorrow sink down into the pit of me." "That was a good belly laugh." It no wonder that we can think of the hara when we think about "centeredness". Where does the heart fit into the picture? The heart, abdomen (hara), throat, and other areas that run the length of the human spine that includes the top of the head, correspond to major energy centers (Ind. chakras). When you say "My stomach was tied in a knot", or "I'm brokenhearted", these are not merely metaphors but by-products of human physiology. Certain emotions directly ignite (or obstruct) their receptive energy centers: love - the heart; doubt/danger - the hara; "getting all choked up" - the throat. The apex energy center - the top of the head - has been likened to divinity, which is why saints have been depicted in paintings as having halos. The heart is actually regarded as the meeting ground between the instinctive/lower energy centers and the intuitive/higher ones. I know your question was only about how the heart fits into the picture, but in order to give the proper perspective I felt an in-depth explanation was in order. Boxing, I didn't know that. Interesting. I still wonder why so much emphasis is put on upper body strengh around here. Once you get the center thing, it all gets so easy... or easier.